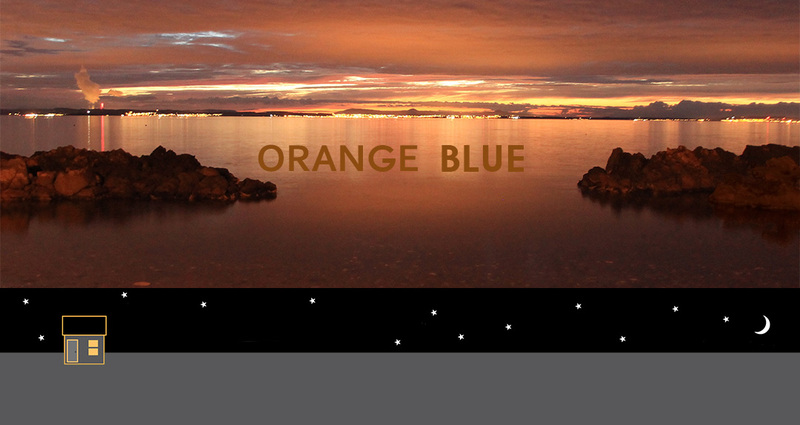 Orange Blue is strangely beautiful and mysterious poetry, – spoken, danced, and played. But is it possible to even say what it is about? I must confess to initially struggling to find a way of elucidating, how do you explain that which is on the threshold of the inexplicable? -Then of course I realised the obvious –it’s the poetry its self that is the door. Because in a way, I and you are all syllables in a landscape, as my poem ‘Syllable’ says. It talks to us about some deeper language of extra dimensions -so much more encompassing than everyday language. In fact, this other, always slightly beyond our grasp, this greater language -when we at last stop and listen on the beach, in the forest, the quiet street, seems more the real language of existence to us, it certainly feels so. It is in such moments, we soon realise, we our selves are syllables too, of this language. Would that we could read it, we might find ourselves unifying as we could not before, where we are no longer such strangers to each other, and are all the more humanely civilised for it. As Richard Demarco contends with his essay and book ‘Road to Meikle Seggei’, We are all on roads paths to ‘Road to Meikle Seggei’ -just as we all artists of our own potential -where we are allowed to be, or can be. And just as Richard has shown in his intervention in war-shattered communities, art, as part of a manifestation of that language, can over arch divisions, even where religion, politics and science, can not reach. And this is what Orange Blue is about at its heart –here, in a small way, to try and explore this mysterious and beautiful universal language. -And maybe bring a little more humane empathy between each other -and see where that may lead….